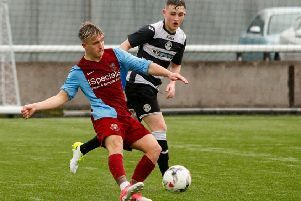 LOTHIAN THISTLE manager Raymond Carr believes his youthful squad will be even better next term now they have gained some valuable first-team experience. The Saughton men had their slim Conference B top-five hopes dashed by Tranent at Foresters Park, going down 4-2 to condemn the three-time champions to a finish in the bottom half. Not for the first time this season, Carr had to call upon several of the clubs’ under-20 players to fill his team in what has been a challenging week for Hutchie, following their 5-1 defeat against Bonnyrigg Rose on Wednesday night. Lothian may have struggled to find their feet in the newly revamped East of Scotland set-up but Carr wasn’t downbeat when asked about their struggle to rubber-stamp a place in the Premier League ahead of next season. “I had to draft in a few of the youngsters from the under-20s during the week and did the same again today because we just don’t have a big enough squad at this moment in time,” Carr stated. “A few of the boys that have been involved recently are only 17 or 18, so I’m confident they will come on leaps and bounds for this experience. “They’ve come up against some really good sides this season and managed to beat teams like Bo’ness, Dundonald and Spartans in a cup competition, so that will prove worthwhile in the long run. “We’ve just dropped silly points against the so-called ‘lesser teams’ which has cost us dearly, but it’s not all doom and gloom. “I told some of the senior players not to be too harsh on the younger lads if they make a mistake because they’re entitled to do so at their age, but I’ve been pleased with their progress. The home side dictated the early proceedings, without seriously testing visiting keeper Kevin Swain, who returned to the starting line-up after recovering from a broken finger. Mark McGovern capitalised on their dominance when he opened the scoring after 29 minutes and the striker doubled his tally for the afternoon three minutes into the second half. Lothian gradually grew into the contest and they pulled one back through Dylan Moore’s composed finish past Sinclair Inglis after 50 minutes. However, defender Shaun Rutherford restored Tranent’s two-goal advantage just moments later with a driven long-range effort which flew through a cluster of bodies and into the net. Hutchie refused to lie down, though, and Jamie Docherty responded almost immediately to halve the deficit, but substitute Bradley Barrett cemented a top-five finish for Tranent with a terrific solo run and shot after 67 minutes. Belters boss Calvin Shand felt his players thoroughly deserved their win after a lacklustre showing against the same opposition just seven days ago. He said: “It was an important game for us. We wanted to right a few wrongs from last weekend because we weren’t at our best and Lothian deserved their win. “I thought we were brilliant in the first half. We moved the ball around at pace and really took the game to them.